Hello fellow and new journalers! 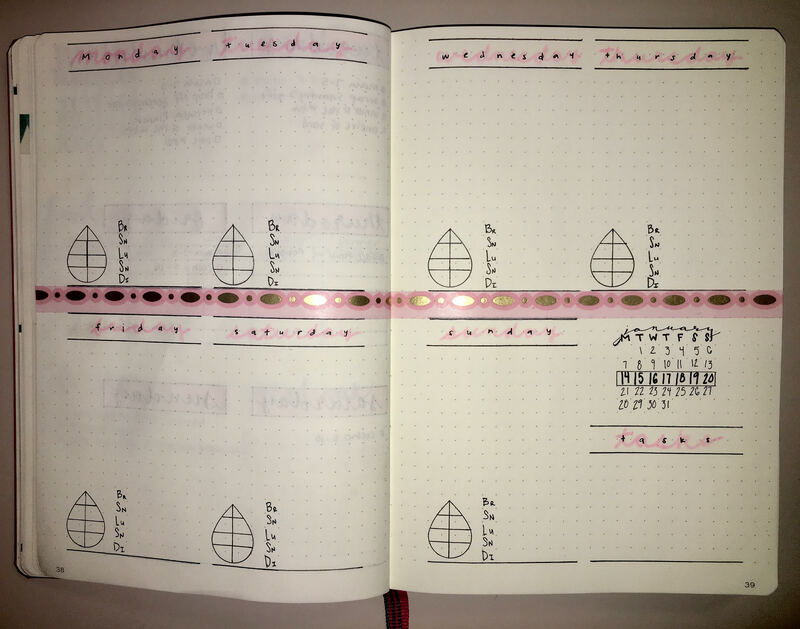 Have you guys been regularly using the journal? I have been doing my best to set the precedence of using it by pulling it out every day. I look at my tasks, add, check off, etc in the morning and then do my best to check again at lunch and then once in the evening. It only takes a few minutes, but it actually rewards me for the work I have already put in. Okay, so last week I didn’t really drink enough water. BUT I was doing really good about bringing lunch and eating regularly. It was amazing how much better I felt throughout the day by regularly having a snack (healthy ones) so I set the intention by keeping that food tracking on my spread. With the added need for water I drew in a water drop and separated it into 8 sections, each section to indicate 10 ounces drank that I will color in throughout the day. I know that sounds like a lot, but I wanted to give myself the option of overachieving. They say (who are they? dunno) that you should drink half your weight in ounces. For me that’s about 70, so I threw in that extra 10 ounces for you know, an extra gold star on the chart.